Locally heavy thunderstorms during the evening will give way to partly cloudy skies after midnight. A few storms may be severe. Low near 60F. ENE winds shifting to WNW at 10 to 15 mph. Chance of rain 90%. 2 to 3 inches of rain expected.. Locally heavy thunderstorms during the evening will give way to partly cloudy skies after midnight. A few storms may be severe. Low near 60F. ENE winds shifting to WNW at 10 to 15 mph. Chance of rain 90%. 2 to 3 inches of rain expected. 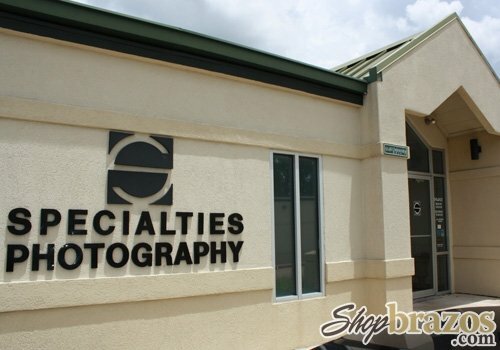 Specialties Photography, Inc. has proudly served the Brazos Valley since 1993 and would like to invite you to call or come by to discuss your special photo needs. Specialties Photography is your locally owned & operated professional portrait studio and full custom digital lab. We are centrally located at 524 University Dr. in College Station.